This oldie, from my illustration MA, is the first screen print I ever did. My style has moved on a bit since then! 1. Develop the concept. I keep a sketchbook for developing ideas, using very quick rough sketches. As soon as I've settled on a concept I move on to Bristol board to start the final drawing. 2. Inking. Once the pencil work is finished I move on to inking with dip pen and ink, which is then scanned into Photoshop for editing, and to create layers for the colours. 3. The colour layers are inkjet printing onto polyester sheet. These print positives are then exposed onto silk screens and printed onto paper one at a time in sequence. In order to register the different layers over each other with high accuracy I use a master copy, with the print positives over-layered on the paper and then lined up against the screen. Once in place, three plastic tabs allow for easy placement during printing. I had a sketchbook day earlier this week, drawing my lovely purple phalaenopsis orchid with Faber-Castell watercolour pencils in my trusty Moleskine Sketchbook. Having fun with iMovie. Music: Jazzfrenchy by Bensounds. After much fun and games trying to photograph my painting, including outside on an overcast day and in the studio with my desk lamps, and failing to achieve good results, I decided to brush up on my photography skills and invest in some new equipment. The main issue I had was how to eliminate glare, which ruined the fine detail across the painting. After much research I found the solution: cross-polarisation photography. This process works by filtering the light from a light source so that the waves light vibrate in only one direction. The polarised light bounces off the painting into the camera lens via another polarisation filter, which rotates the light waves 90 degrees to extinguish all reflected light, thereby eliminating glare. First I needed to buy some new equipment: a couple of entry-level continuous tungsten lamps, lighting stands, a 50mm prime lens and linear polarisation filter for my DSLR camera, and a sheet of linear polarisation filter for the lights. You can use any powerful lamps (300w minimum), and I looked at work lamps and red tops as cheaper alternatives, but I wanted a compact kit with a bag for easy storage, which I could also use for other studio photography work. These Interfits were £200 on Amazon including stands and umbrellas. I needed a prime lens because entry-level zooms aren't as sharp, tend to distort flat images and have a small aperture range. So I bought the Canon EF 50mm 1.8 STM, a classic budget prime lens, with a Hoya PL49 linear polarisation filter, for about £120. You can use a circular polarisation filter, but the effect is apparently not as great. The filter for the lights was a bit tricker to get hold of. It's easy and cheap to buy online in the US, but they wouldn't ship to the UK, and for some reason in the UK it costs 3 times the price. I finally managed to buy some reasonably priced from Israel via eBay. The quality wasn't amazing, it was a bit scratched, but it did work, and cost around £30. As you can see below, I set the lights up at a shallow angle to the painting, with the framed polarisation filters clipped to the stands in front of them. I had to be careful not to put the gels too close, as the lights get very hot and they did start to blister at one point, so I kept them switched off when I wasn't shooting. You could of course use strobes instead which wouldn't have this problem. but they're much more expensive. As the filters dim the lights considerably, a long exposure is required so a camera tripod is essential. I tethered my camera to Adobe Lightroom, which you can then use to trigger the shots and reduce all camera shake. I shot at night and switched off all other lights, to avoid light contamination, and used RAW / ISO100 / 4 seconds / F18, with a custom white balance using a grey card. Some cameras have a problem auto-focusing with a linear polarisation filter, but my Canon EOS 100D worked fine. Once the background lights are off and the spots are on, you turn the camera filter round clockwise, and as if by magic the glare disappears. The process worked brilliantly for me and completely eliminated the glare, however there was one issue: I used gold paint for the coat detailing, and the polarisation filter killed the colour dead. I got round this by taking further pictures without the filters, and composited the images in Photoshop. The other thing which really helped was shooting RAW and editing in Adobe Lightroom. With the painting set up next to my monitor I found it much easier than I would have done using Photoshop alone to edit the photos to match the original image as faithfully as possible. A costly exercise to be sure, but well worth the time and money, and I'd highly recommend for photographing your artwork on a budget. Painting update: onto the final layer! I draw up loads of ideas in my sketchbook, very roughly and quickly, and pick out the best ones to develop further. Here I was inspired by the cormorant because I live in the docklands in east London and regularly see them drying themselves in the sun or diving for fish. I develop my idea in pencil on bristol board, then ink with dip pen, brush and black ink. I use No. 3 ink and dip pens by Japanese brand Deleter. They are marketed towards manga artists, but will work for any style. The No 3 ink has lovely flow and a good solid black. Here I used Strathmore 400 Series Bristol board. It's good quality and comes in large 45.7x61cm size. 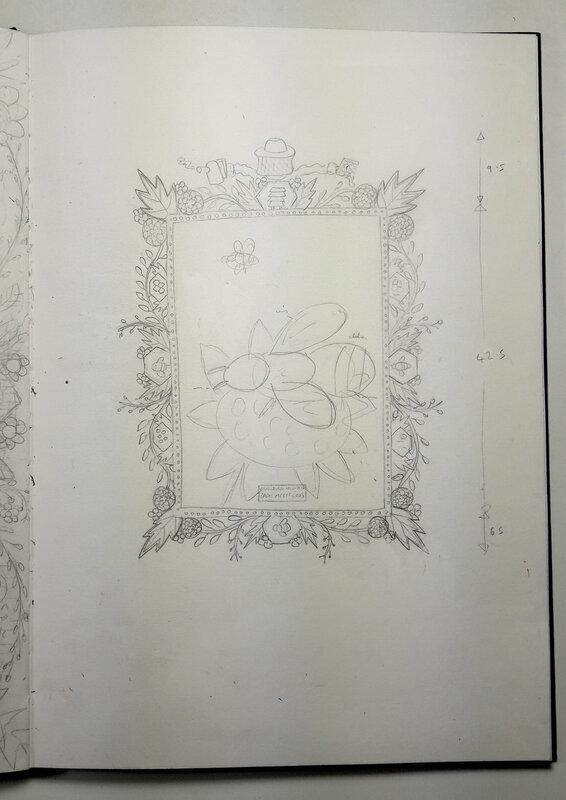 After scanning, editing and colouring the inked drawing in photoshop, each colour is printed as a separate black layer onto a transparent polyester sheet. These are the 'print positives'. Separately each positive is placed on a large exposure unit, underneath a silk screen coated in photosensitive emulsion, and exposed to light. Where the light passes through, the emulsion hardens, where it is blocked by black ink, it remains soft, and is subsequently washed out, leaving a negative image on the screen. Here my 5 print positives are layered on top of each other to create a 'master copy', which I use to register the paper with the screen, so that each layer is exactly where it should be on the paper. The negative image on the screen effectively works as a stencil, because ink can pass through the silk, but not through the hardened emulsion. 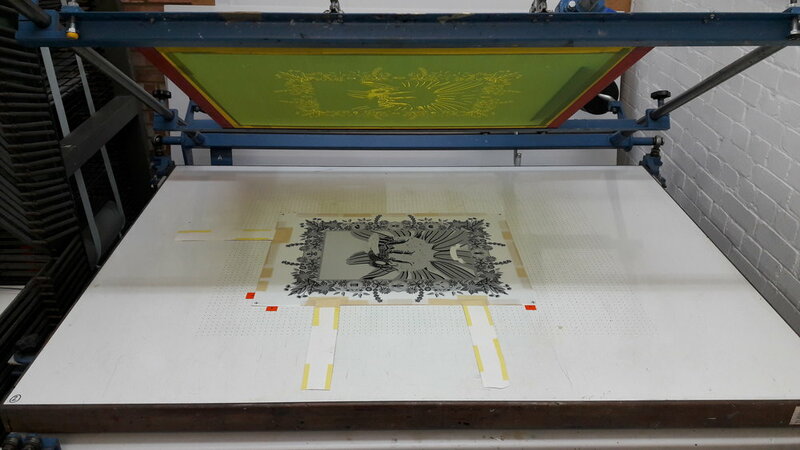 The paper is laid out on a printing bed and the screen is locked into the frame above. The screen is lowered over the paper and using a 'squeegee', the ink is moved across the screen, through the stencil and onto the paper, leaving a positive image.. I use Aqua Art printing ink. It is expensive and tricky to use, but it's stunning, creating rich, dense, vibrant, glossy colours and black. The ink 'sits' on the paper, giving the print a hand-made, organic, almost sculptural feel which digital prints simply cannot match. After completing a full print run of one colour, you clean out the screen then repeat the process for the next layer. It's a physical and time-consuming process. Here I've completed 3 out of 5 layers. The entire printing process took me 24 hours in total, over 3 days. The hard work pays off though when the print comes together at the end with the final black layer. You can see from this image just how important it is to get the registration of the layers absolutely correct, so that there are no ugly overlaps. The tolerance is around 2mm. Also, the way Cormorants dive for fish is amazing - they can stay underwater for ages! I have just come back from the the brilliant Georgia O’Keeffe retrospective at the Tate Modern. It’s a really extensive show, spanning O’Keefe’s long, groundbreaking career from start to finish, and it is fascinating to see how her work progresses over time. My favourite period is the New York cityscapes from the 1920s, with pieces such as ‘New York Street with Moon’ (1925) and ‘Ritz Tower Night’ (1928). Her vibrant colouring and dynamic compositions, featuring semi-abstracted, sharp-edged forms, convey a wonderful moody atmosphere and really capture the essence of the city. I also really loved her flower paintings, for example ‘Oriental Poppies’ (1927) and ‘Dark Iris No 1’ (1927). Again, her colouring is exceptional, and her striking, sharp-edged, semi-abstracted forms and tightly-cropped, close-up composition, really capture the sensual beauty of organic natural forms. I didn’t like everything, I must admit. I found her mountain landscapes, for example ‘Red and Yellow Cliffs (1940) a bit dull. And whilst some of her skull paintings are brilliant – I loved the series of eye-holes in close-up where the yellow greys of the bone contrast against intense blue of the sky, for example in ‘Pelvis IV’ (1944). However some of them, such as ‘From the Faraway Nearby’ (1937), did look a bit like 80s fantasy art. Nevertheless, I found the exhibition really inspiring, and came out a big fan. My studio at work, plus Millie on her perch. Winsor & Newton Extra Smooth Bristol board is my favourite surface to draw on. It’s thick, smooth, bright white and really hard-wearing. Strathmore Bristol board is also good, it is slightly thicker but does come in a strange non-metric size. Pentel P203 / P205 Mechanical Pencils are perfect for drafting. They're inexpensive, comfortable, robust and reliable. I literally carry one of these around with me every where I go. The Staedtler Mars Plastic is not really an ‘art eraser’ but I love it. It’s cheap, it’s just the right level of softness, it doesn’t get too dirty like some rubbers do, and it’s incredibly hard-wearing. I’ve tried loads of different dip pens but Deleter Free Penholder with G-Pen, Saji & Maru Nibs are by far my favourite. The pen holder is comfortable in the hand, really robust and has 2 different slots in the end so it can take round and flat nibs. The Maru nib is really thin so it’s good for fine detail. The Saji is a bit thicker. My favourite is the G-Pen, which has a lovely smooth action. Deleter is a Japanese brand, designed for manga artists, but I think it works for any pen and ink drawing. There are 8 different types of ink – 6 black and 2 white, with varying degrees of lightfastness and opacity. My favourite black in is the No 3, which I decant into a glass dropper pot. It’s easy to use, flows really well and most importantly it gives a lovely solid black. I love Uni Pin fine liners – they’re not the fanciest, but that’s part of the appeal. I go through pens at the rate of knots, and they're much cheaper than Edding 1800 Profipens and just as good. I have a couple with me at all times. I hadn't heard of Jean-Etienne Liotard before, so the exhibition on the RA was a revelation. His technique is breathtaking, especially his masterly use of pastels, which rivals even Degas. With dropped jaw I kept mouthing to myself 'how did he do that? ', particularly the amazing miniatures. My favourite piece though was 'Mary Therese Liotard' (1780), a really striking etching of his daughter that he made purely for himself. I have decided to extend my practice into oil paintings. I’m really enjoying the process: brushing up on colour theory; learning oil paint techniques; putting together a colour palette; researching and purchasing all the equipment (paints, brushes, mediums, canvas, frames etc). It’s painstaking and geeky and I love it! The painting is quite ambitious and marks a stylistic change of direction too, though its unmistakably me. I thought I’d share a photo of how I mapped the 2 point perspective. 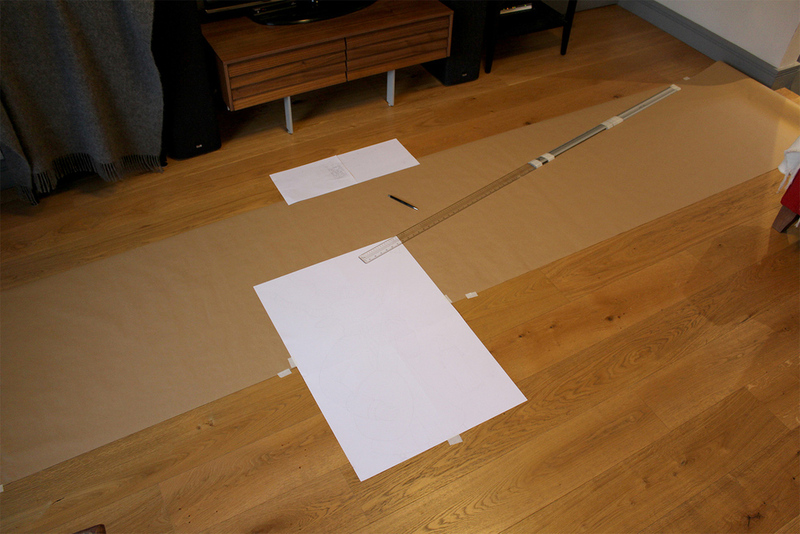 I had to use the whole width of my living room with 3 large rulers taped together to make it work, as my studio wasn't big enough. I understand M.C. Esher had to do the same thing! Thanks to David Chelsea for his excellent book 'Perspective! for Comic Book Artists', which I've found incredibly useful. An oldie from my sketchbook from during my MA.